It’s that time of year again. The mornings are chilly and by noon it is warm outside. The best way to dress during seasons like this is to wear layers. This cowl is made to supply warmth and comfort to help kick start our days. The stitch I came up with for this cowl is so much fun. It includes 3 beginner stitches- making this a great project for anyone. A small amount of same yarn in contrasting color. Row 2: CH 1, turn. HDC into the first stitch. **CH 2. Skip 2 stitches. HDC into the next stitch. Repeat from ** across. Row 3: CH 1, turn. 3 HDC into each CH space across. HDC into last HDC. Row 4 – 71: Repeat rows 2 and 3. Your piece should measure 27 inches long. Finish off leaving long tail. Using your yarn needle, weave back and forth joining both ends. Weave in your ends. 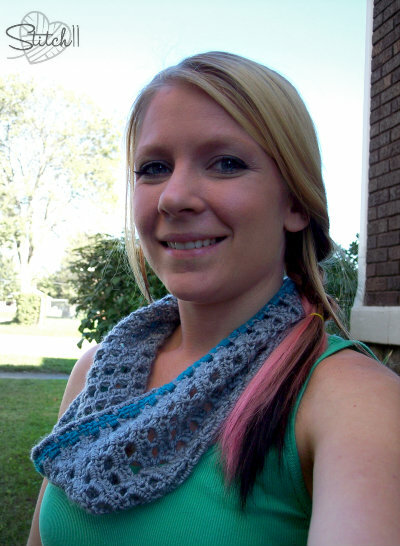 Join your contrasting yarn into the side of the cowl in a CH space. Row 1: CH 1. **2 HDC into CH space. 1 HDC into the side of the HDC. Repeat around this side of the cowl. When you get to the seam, space 4 HDC into the side of the seam. Join to first HDC. Change to your original color. Join your yarn into a HDC that is in the side of a HDC. Not a HDC that is in a CH space. Row 2: CH 1. HDC into the first stitch. **CH 2. Skip 2 stitches. HDC into the next stitch. Repeat from ** around. Join to first HDC. Row 3: CH 1. 3 HDC into each CH space around. Join to first HDC. Join your main color yarn into the side of the cowl into the side of a HDC. Row 2: CH 1. 3 HDC into each CH space around. Join to first HDC.